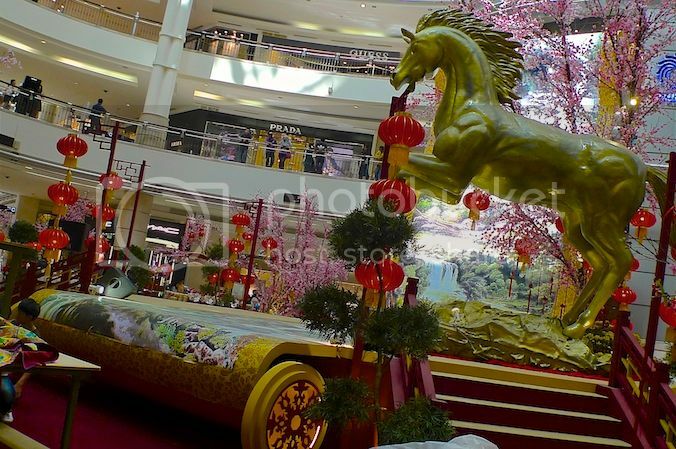 Happy Chinese New Year of the Horse everyone! 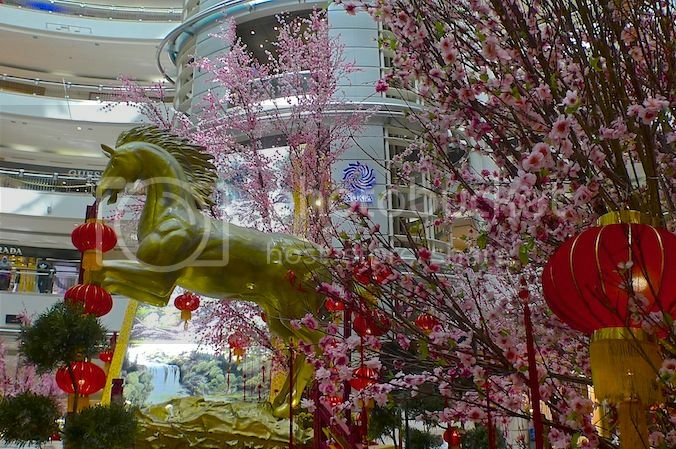 Today is the 4th day of Chinese New Year and for those of you who celebrate, I hope you have had an enjoyable time. 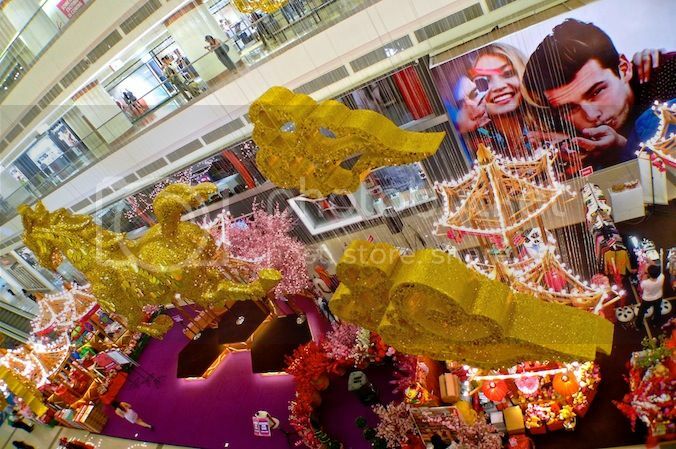 Before the 15-day run of the Chinese New Year celebration is over, I guess I had better share about the Chinese New Year decorations in major shopping malls around Klang Valley. 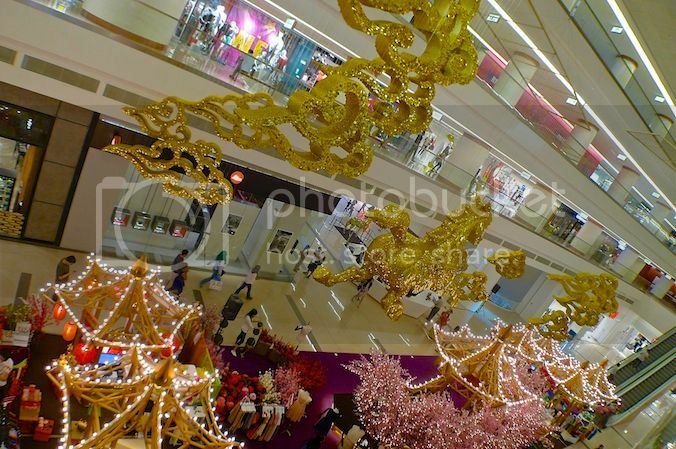 This year, I visited a total of 14 shopping malls around Petaling Jaya and Kuala Lumpur so expect lots of photos in the next few posts! 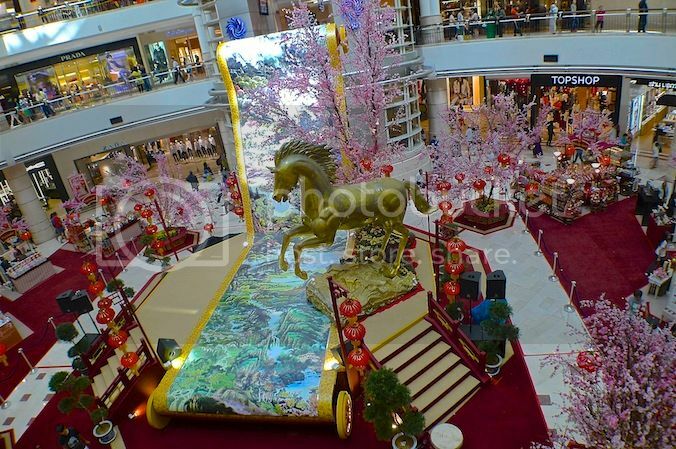 Since it's the year of the Horse, many malls made use of the horse as the main theme for their decorations. 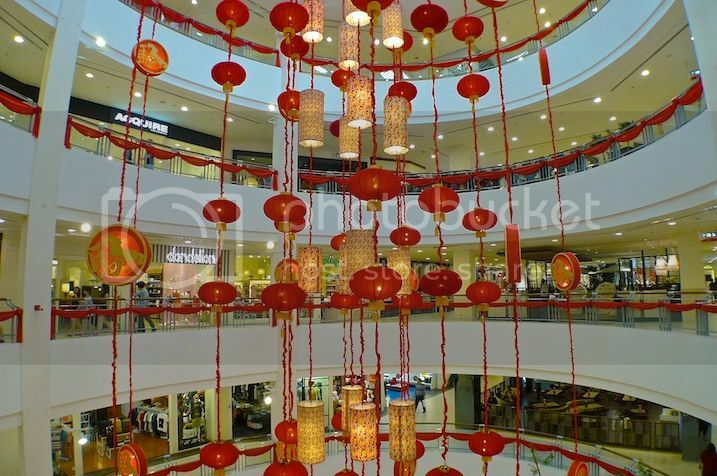 One of them is Suria KLCC. 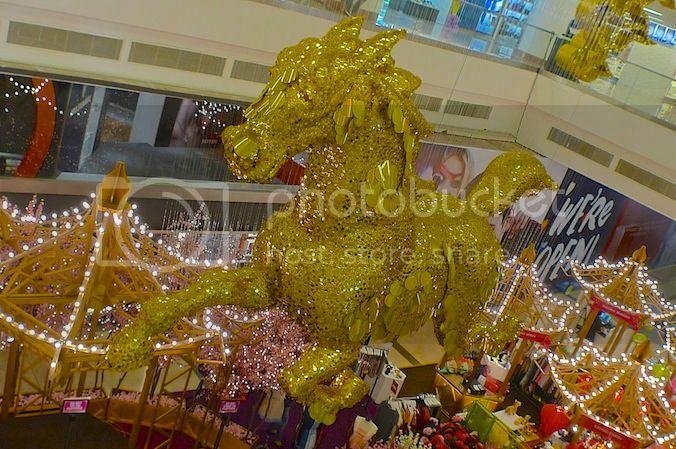 There's a giant golden Horse at the main concourse with its front legs lifted high up. 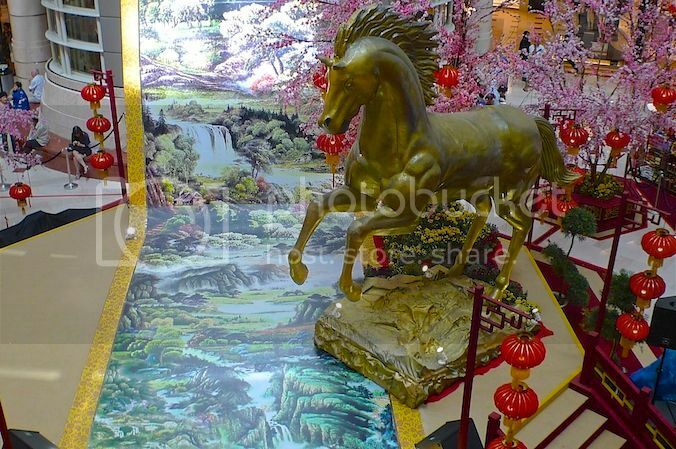 The Horse appears to be standing next to a giant scroll that has paintings of mountains and rivers. Perhaps the scroll brings good news for the new year? 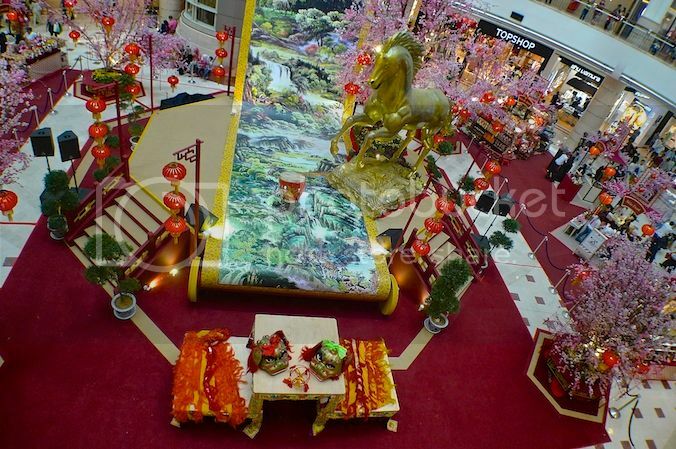 I passed by the concourse area again a few hours later and saw that they had placed 2 lion heads in front of the scroll. 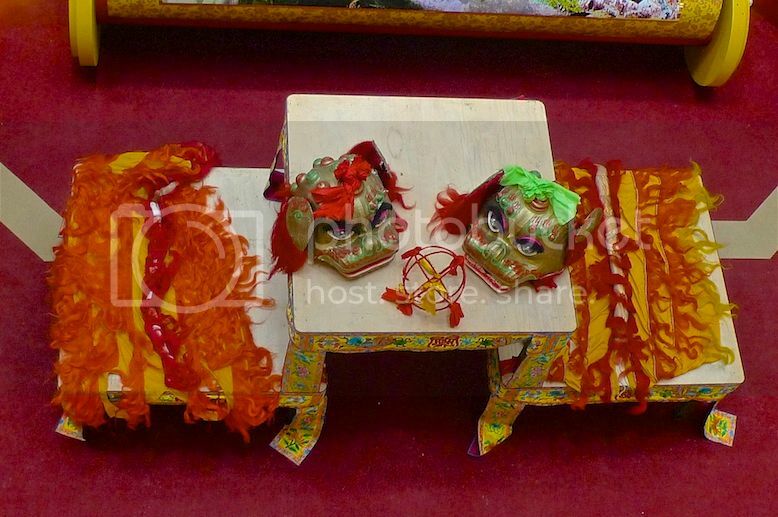 Perhaps there would be a lion dance later but I did not wait to watch the performance. 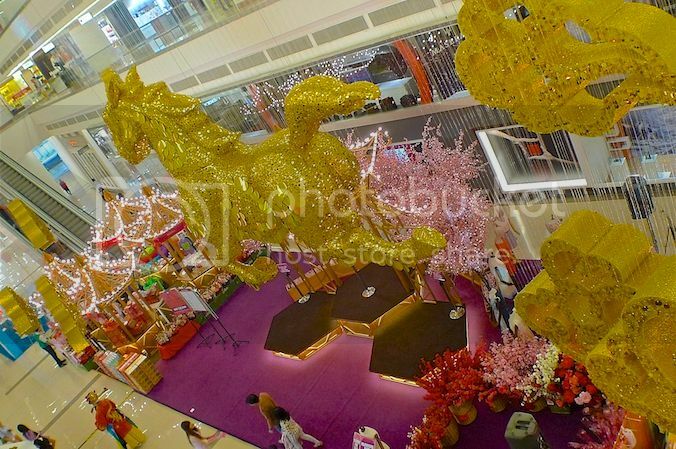 How do you like this year's Chinese New Year decoration at Suria KLCC? 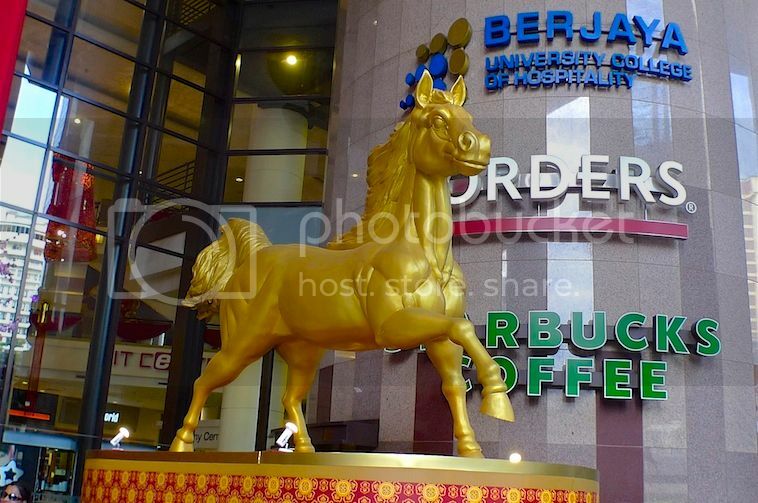 Berjaya Times Square has two horses in front of the main entrance. I took a photo of one of the horses. Inside, there were no more horses. 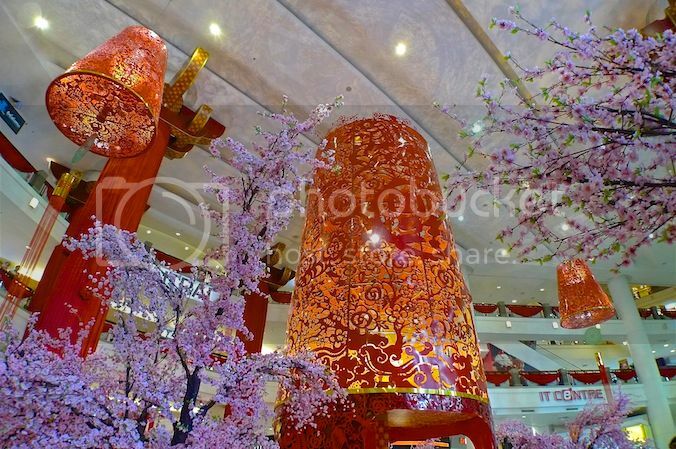 Instead, what greeted me was a giant lantern at the main concourse area. 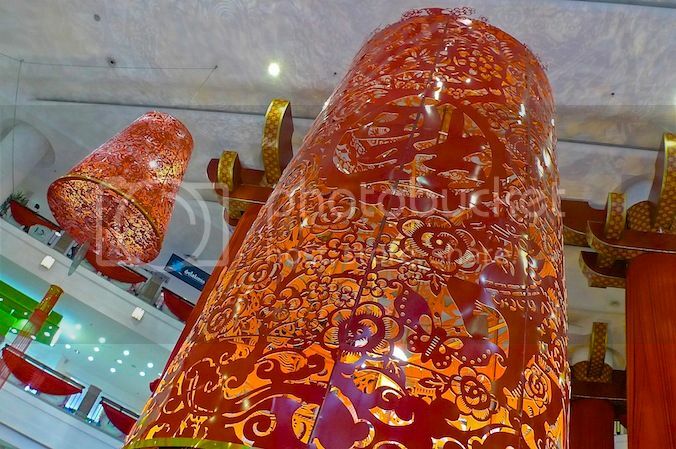 The 9.7m tall revolving lantern is inspired by Chinese paper cutting art. 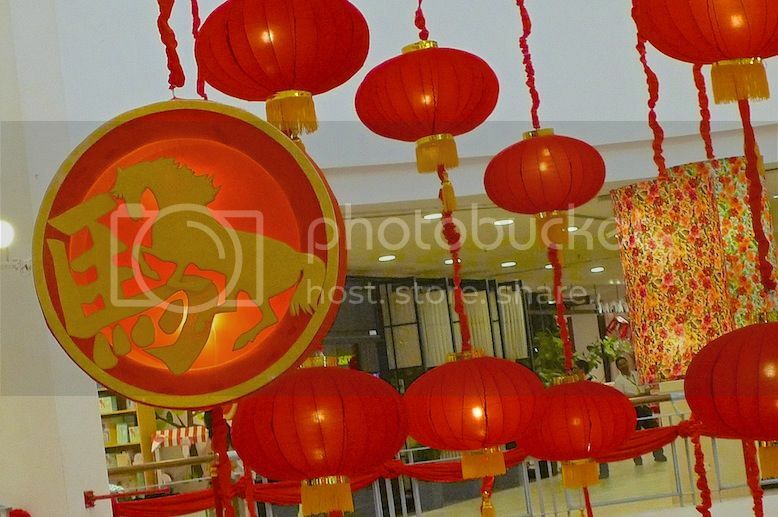 Can you see the image of a horse on the lantern? I thought it was pretty beautiful! 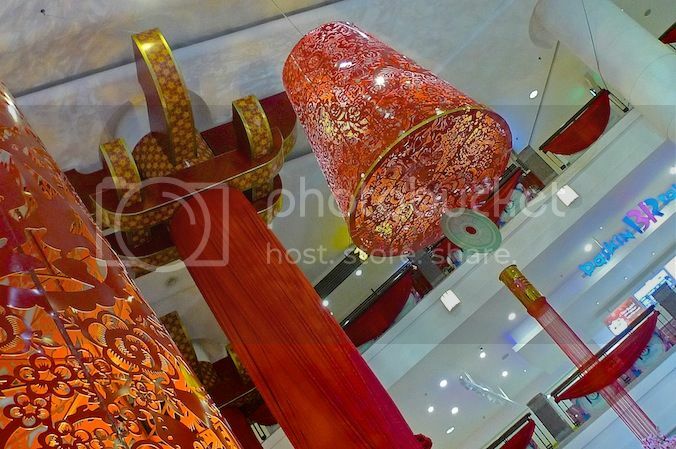 The big lantern is flanked by two smaller lantern on both sides. 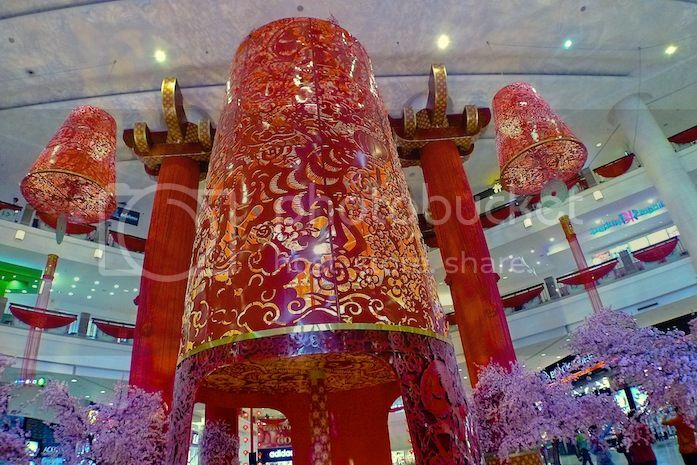 Do you like this year's Chinese New Year decoration at Berjaya Times Square? 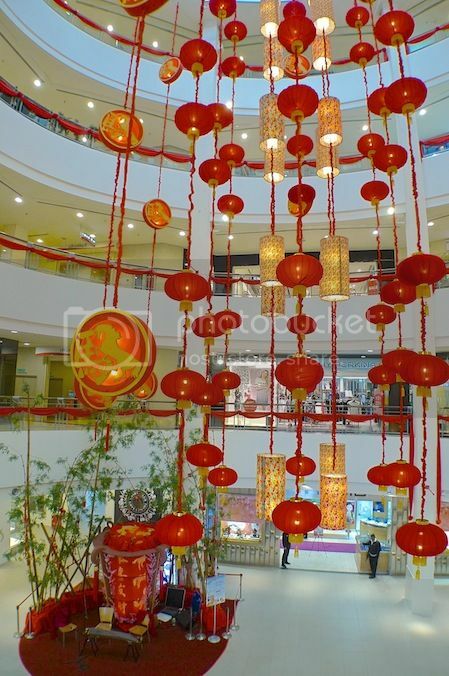 Having taken pictures of Christmas decorations at Avenue K shopping mall in Jalan Ampang last year, I decided to check out their Chinese New Year decorations this year. 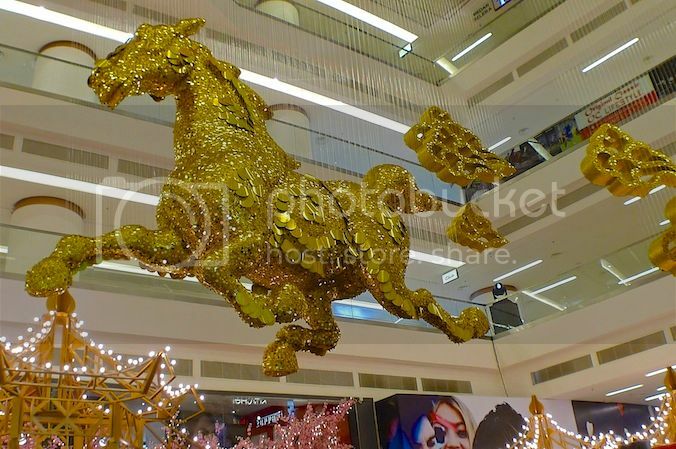 I saw a huge Golden Horse suspended in the air, apparently flying amongst the clouds in the sky. Below the horse and the clouds are stalls in the shape of pagodas. 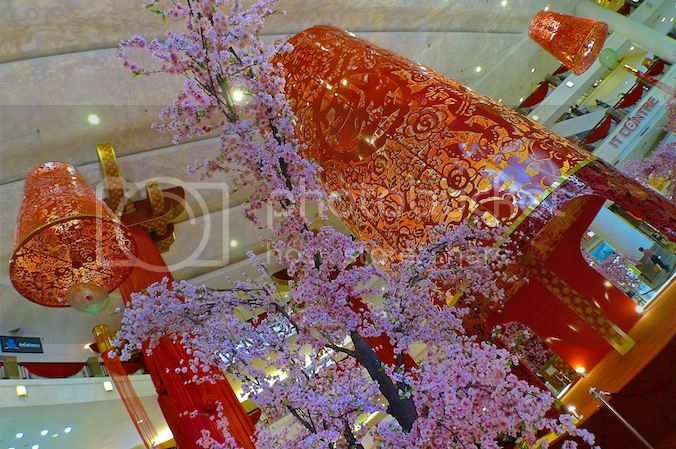 Can you see a man dressed as the God of Fortune at the concourse below? 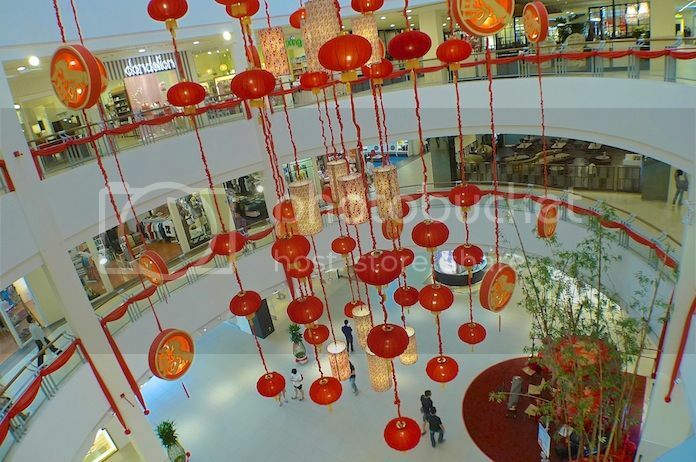 This year, Bangsar Village II showcases lots of red and gold lanterns hanging from the ceiling of the mall. 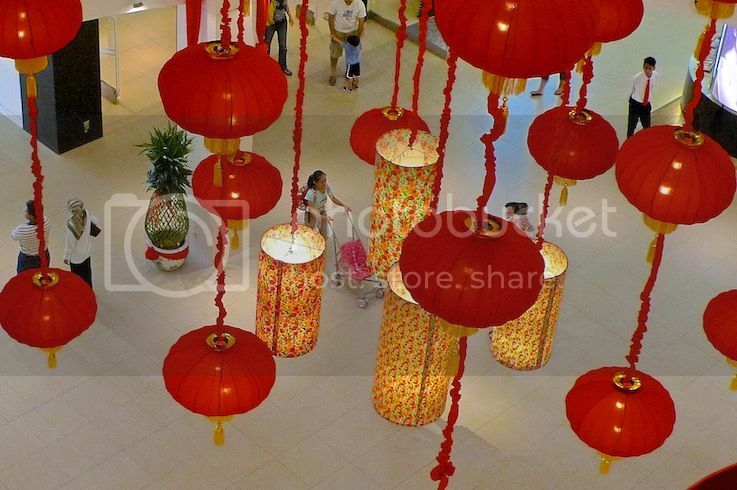 Now is that a lot of lanterns or what? 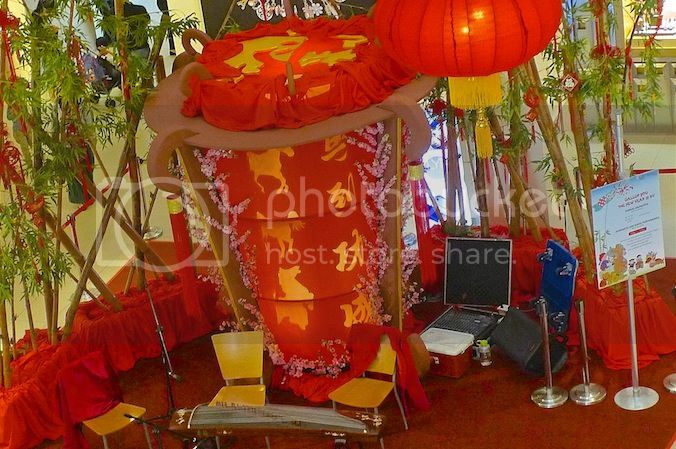 There is a revolving lantern with Chinese characters on the ground. 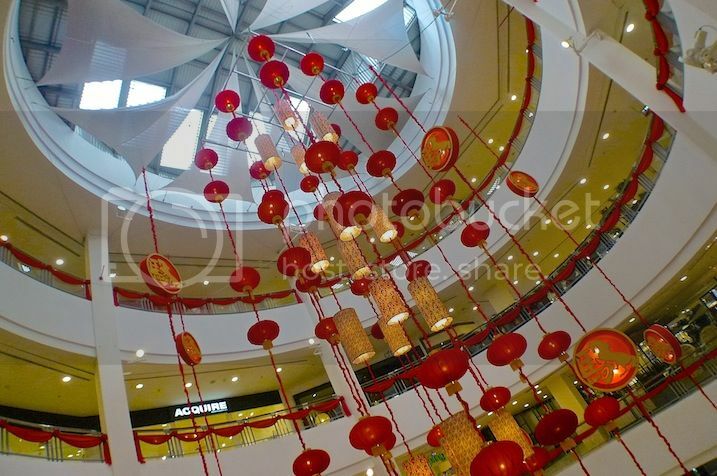 How do you like the Chinese New Year decoration at Bangsar Village II? 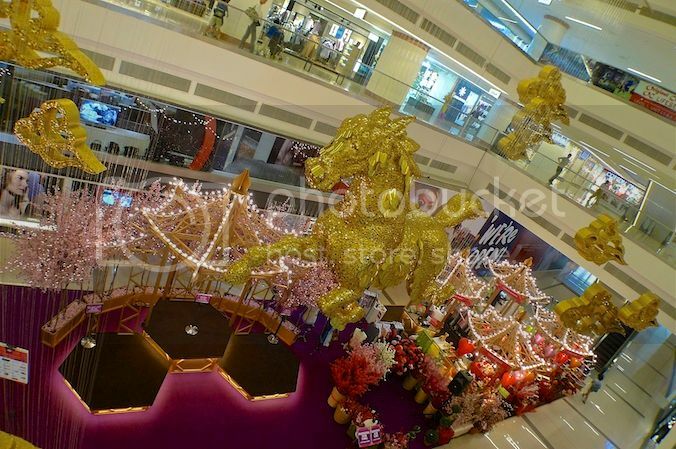 In Part 2, I will share with you the Chinese New Year decorations at The Gardens, Mid Valley Megamall and more, so stay tuned!